The month of November started with joyous Diwali time at the Ashram. A few weeks of planning and preparations by so many devotees culminated in Grand Annakoot offering to Maa Sri. Ashtalaxmi on Deepavali day (Nov 1, 2005). Entire day, over a few thousands people came for the Holy Darshan and to receive the grace of Sri Sri Sri Ashtalakshmi Maa. Late in the evening Aarti was performed by H. H. Sri Swami Adhyatmanandaji Maharaj which was followed by Diwali Annakoot Prasad and dinner. About seven hundred Prasad packages were made of sweets, snacks and dry foods and were distributed on the New Year day morning to the people in underprivileged area of the city. Diwali and New Year's Satsang was held in the evening on November 4, 2005 at Smt Nipunaben's residence where Swamiji invoked the grace of God and Gurudev. A collective prayer was done for the peace and the welfare of everyone. At the ashram regular Yogasana classes were crowded during the month of November. A few special satangs on Devothana Ekadasi, Tulsi Vivaha, and Tripura’s Purnima festivals were attended by large numbers of devotees in the Ashram's temples. Yoga Teachers Training Camp (Dec 11, 2005 – Dec 30, 2005) at Sivananda Ashram, Ahmedabad. Yoga Teachers Training Course at Sivananda Ashram, Ahmedabad is organized under the guidance and leadership of Yogacharya Sri. Swami Adhyatmananda, who has been teaching yoga over thirty years and has conducted over 650 yoga camps to his credits. He has been a monk for over thirty years and sharing the teaching of Holy Master Swami Sivanandaji Maharaj. The YTTC will provide you a wonderful opportunity to further develop your skill in the science of Yoga and expand your abilities to teach yoga to others. You will be learning from a Master. Ashram’s serene atmosphere is ideal for enhancing your spiritual growth as well as the skill in the field of Yoga Science. The course is available to student who has completed basic and advanced Yoga classes at Sivananda Ashram or from equivalent courses (after prior approval) at other institutes. And students, who wished to enhance their knowledge of Yoga Science or become a teacher in the field of Yoga. Relevant knowledge of anatomy and physiology by expert doctors in the field. Meditation technique, Yoga Nidra- relaxation techniques. Participant should have minimum qualification of having Graduation from University. Participant's age should be under forty years to enroll in the course. Education will be imparted in Indian Standards of teachings and sitting on the floor in traditional manner is mandatory, hence the participant should be physically fit to be able to sit on the floor. Smoking and use of alcoholic drinks are prohibited during the stay at the ashram. On successful completion of exam, including theory and practical, the graduate will receive a diploma certificate recognized by Gujarat University and will be able to teach Yogasana and pranayama to others. On Nov 5 2005, Swamiji went to Delhi, attended a Silver Jubilee function of M & M Industries and Golden Jubilee function (50th Birthday) of its founder Mr. Manoj Syngal. After that Swamiji went to Panchkula to see worshipful and revered Dr. Aksheykumar Guptaji, an ailing devotee of Sri Satguru Swami Chidananda Maharaj. During his stay in Delhi, Rev. Swami Maharaj visited Mr. Rajneesh Kashyap ji's (a senior ground engineer of Indian Airlines) home and performed Satyanarayan Pooja and Navachandi Havan on the occasion of their new house warming. Sri Sri Ravishankerji of "Art of Living" organized a one-day National Seminar called ‘Ladli’ on 8th Nov. 2005 at New Delhi under auspices of United Nations Population Fund Act (UNPFA). In the present context in India, the issue of Female Feticide needs utmost attention. In the above Seminar the issue was discussed at length. The Seminar was attended by number of NGO representatives, Hindu Saints, Jain Munis, Muslim Immams, Bhudh Bhikhus and Social activists from all over India. In the above National Seminar called ‘Ladli’ H. H. Swami Shri Adhyatmanandji of Sivanand Ashram, Ahmedabad also delivered a memorable lecture. His lecture was very thought provoking and greatly appreciated by the audience. His emphasized to treat a baby boy and a baby girl equally at par. He criticized the doctors for their illegal practice by aborting the female fetus. He made a humble request to one and all present there to bring social awareness about this issue and to educate people at large. All the saints, Mahatmas and representatives of different organization present there in the Seminar signed collectively on a special circular and decided to do something for this social crime of female feticide by bringing awareness in the society. From Nov 8, 2005 to Nov, 15, 2005 Rev. Swamiji was in Haridwar for his annual discourses at BHEL (Bharat heavy Electricals Ltd.), Vedanta Sammelan of Parmananda Bhandar and Sri Sri Sri Maa Anandamayi Maa's Sayam Mahavrat. Honoring devotees request, Swamiji made home visits and home sasnags were arranged during his stay in Haridwar. Nov 15, 2005 Swamiji went to Yamuna Nagar and graced the Lakshmi Industries. From Nov16 to Nov19 Swamiji visited Ludhiana. Satsangs were organized at Rakh Bagh and at Airforce Station, Halwara by Mrs. and Mr. Rajkumar Jain family. A bicentenary celebration of late Revered Sri. Jain Muni Sri Amarsen Ji Maharaj at Jallandar was arranged from Nov 19th to Nov 21st. Swamiji attended the function and shared his view on Jainism. Who is Jain? The word came from “Jina”- One who conquers his inner enemies like anger, greed, and passion, ego, etc. The followers of “Jina” are known as Jains. He talked about the Navkar Mantra - The most fundamental Jain prayer. He laid emphasis on five vows of Observance of Ahimsa (non-violence), Satya (truth), Asteya (non-stealing), Brahamcharya (celibacy), Aparigraha (non-possessiveness). He further added, being Jain we follow strict discipline, avoiding spices, garlic or vegetables, living on boiling water during Aayambil Vrat, Chowvihaar Vrat and Attham fasting but then we allow ourselves to attend the wedding ceremony, other social gatherings and parties, where non vegetarian dishes are served. We do not get perturb, when we see such cruelty to the nature. Please ponder why do you go such places? Not only the animal but also the unborn female fetuses have been killed through abortions. Also because of dowry system so many girls have been getting ill treatment and even get killed. At that time where our vow of non-violence stands? Let us be serious about all these and prove ourselves as real devotees of Mahatma Amar Singhji, a great Jain Muni, whose bicentenary we are gathered to celebrate here today. Let us be honest and faithful to our Jainism vows, not only in external thoughts but live the life of nonviolence in thought, speech and action. Swamiji's satsangs were organized at Sri Guru Teg Bahadur Nagar, Gurudwara on Sunday (Nov 20, 2005) as a part of Gurunanak Jayanti celebration and attended satsang at Saraswati Adhyatma Mandir at Tagore Park. Upon sincere invitation of Sardar Yoginder Singh, Pramukh Jathedaar of Sri Harmandir Sahib (Swarna Mandir Amritsar), Sri Swamiji paid his homage at Holy Sri Gurudwara of Swarna Mandir as well as famous Hindu Sarovar Temple - Durgyan. Also stasangs were organized at Ranika Bagh, Lawrence Park and Sri Jiyalalji's residence, a devotee of Swami Sri Chidanandaji Maharaj. On Nov 22, 2005 Swamiji arrived at Dr. Akshey Kumar and Smt. Meena Guptaji's home at Panchkula. All these three days Swamiji spent in a prayerful mood for respected Dr. Sri Akshey Guptaji's well being. Home satsang was organized on Nov 23, 2005 on the occasion of holy and happy birthday of Sri Sri Sri Satya Saibaba. Chinmaya Mission Panchkula invited Swamiji for its Gita study group program. During his visit Swamiji visited an orphanage and greeted the children. On Nov 25, 20005 a satsang was organized by the Divine Life Society, Ambala at Sri Sivananda Satsangh Bhavan, which was organized and led by Dr. Om Prakash Sharmaji, president of the society. 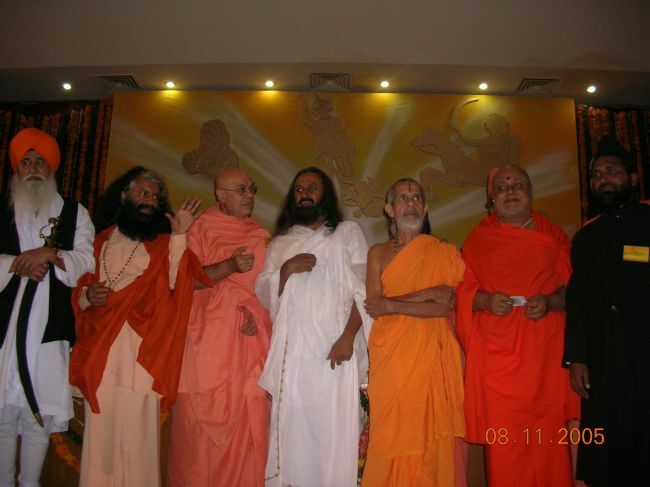 On Nov 27, 2005 Swamiji attended a satsang organized by Smt. Rita Mataji and Sri Pradeep Dave of the well-known "Zydus Cadila Pharmaceutical Company” at their residence in the evening.